In the light of the current governing conditions where geographical, political and social borders are rather fluid or even dysfunctional, Antoniou tries to involve micro and macro politics in order to explore the interrelation of parallel, yet equally semantic personal and public understandings, aiming to tackle history, culture and privacy. While social structures shifted their rigid focus and cultural boundaries weakened, there is an even stronger desire towards exploring one’s individual context and the need of belonging since finding one’s private and sociopolitical identity involves to a great extent his/her essential feeling of place-ness and homeliness. Ironically, the work fluctuates between binary oppositions as the host becomes the aggressor, the enclave becomes the besieger and the other becomes you. Staged in ways that various readings may occur, the installation evokes diverse significations according to ones physical, cultural or political point of view. 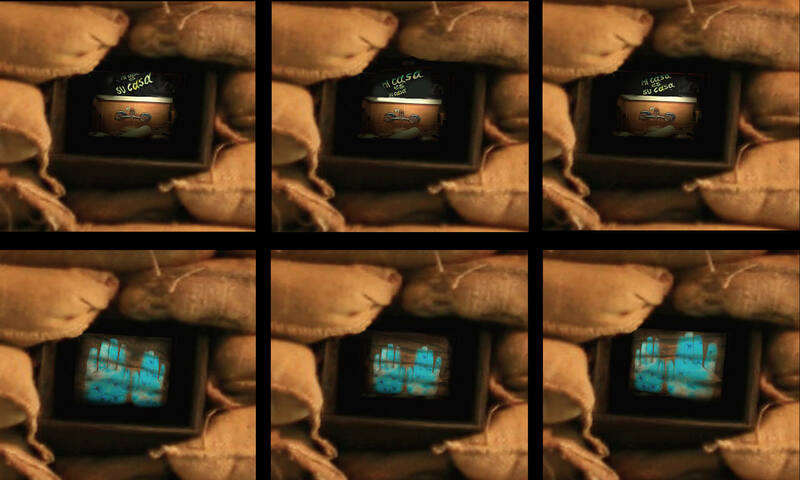 Rough sacks of sand form a wall alike those sheltering a war position. 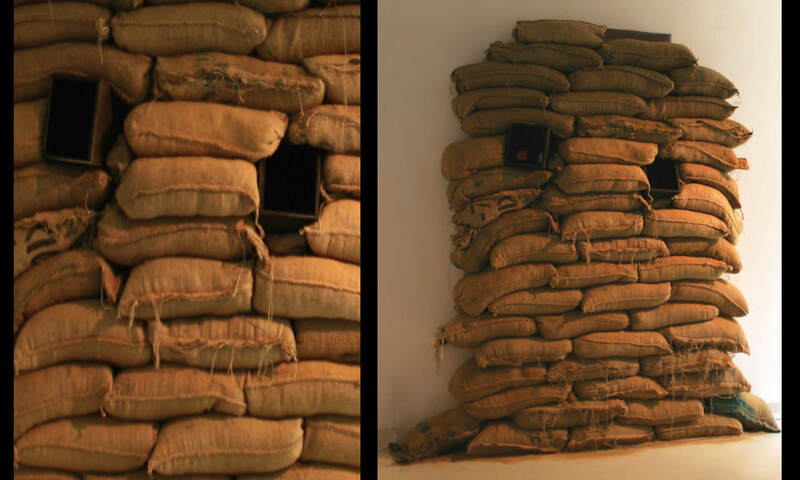 Small openings in between the sacks imply the positions where soldiers would normally point out their guns. These awe-inspiring ‘windows’ invite the viewer to watch the interior of a space, where a video runs a text reading, mi casa es su casa, an expression, which translates from Spanish to English as: my house is your house. Both inviting, suggesting that one may feel at home, as well as anxiously hostile that one may literally take over another’s house, the work is uncomfortably ambiguous.